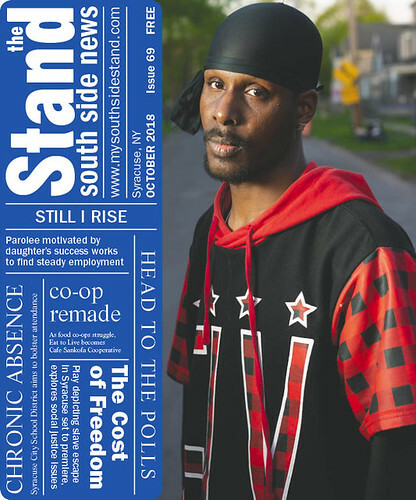 In this issue, The Stand shares the third piece in its continuing “Prison to Family” series on Shallah “Brooklyn” Beal who continues to move forward despite several setbacks. Also read this month’s Fatherhood Q&A with Adonis Kinsey, owner of High Octane, a youth basketball program, and father to Gia Sinoda Kinsey. The pair spend countless hours each week on the basketball court training Gia on her game. Follow along with a local voter education task force team hitting the streets to encourage South Siders to register to vote, learn about a new attendance initiative of the Syracuse City School District run in partnership with Harvard University and much more. There is still time to visit our project’s Photo Walk exhibit showcasing images captured during this summer’s South Side Photo Walk. Thirty images will remain on display through October at The Link Gallery at the Nancy Cantor Warehouse, 350 W. Fayette St. Grant funds received this year also allowed for several images to be on permanent display throughout the South Side neighborhood. Now that the grant period has concluded, we are seeking sponsors to help display more photos throughout the city. If your business, nonprofit group or center would like to cover the cost to print and hang a photo, contact The Stand’s Director Ashley Kang at (315) 882-1054 or email ashley@mysouthsidestand.com.